Rear-Admiral Sir Robert Calder, who commanded the naval squadron based in Bantry Bay, wrote to the Rt. Hon. William Wickham on 22 December 1803 to request protection for his victualers and store ships, which were to be based at the Berehaven anchorage to supply his squadron . Wickham agreed that protection for the ships was necessary and instructed Lord Cathcart to order his engineers to carry out the work. 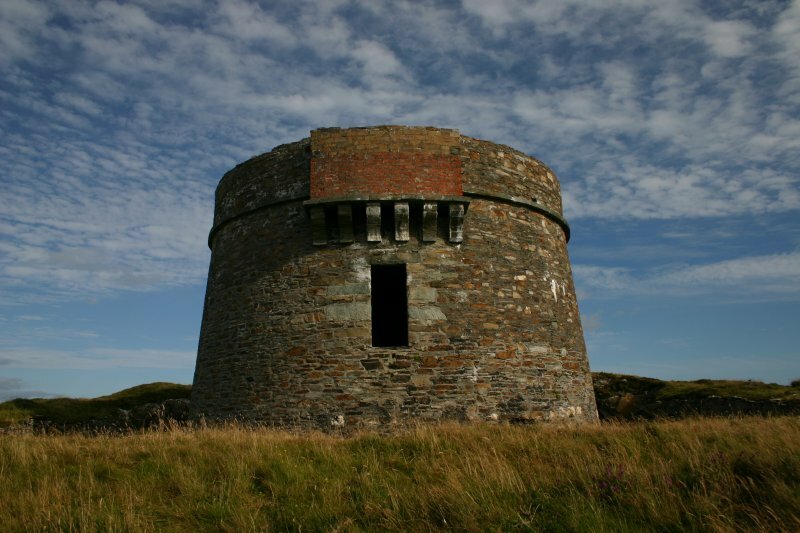 The Bere Island towers were reported as ready on 2 February 1805 and were therefore probably the earliest Irish towers to be completed . The four, all circular in shape and built of rubble masonry, were sited to defend the anchorage between the mainland and the small harbour of Lawrence Cove on Bere Island. Bere Island was a very active Base during World War 1. It was the last training base for units such as the Munster Fusiliers before they set off for the Fronts. The British Channel Fleet regularly used Berehaven Harbour during this time and Admiral Beatty set out from here for the Battle of Jutland. All this activity was very good for the economic life of Bere Island. Many local people were employed at the base and there was a good market for local farming produce.